Thank you for all of the kind words, facebook statuses, and re-blogging that have happened since I released my fall/winter collection a few days ago! Your support and encouragement is why I do what I do.. thanks so much for being there and giving me a reason to move forward with this blog and shop. You have no idea how much it means to me. In the morning, Neil and I are running away to Chattanooga to visit the Tennessee Aquarium and maybe eat at Public House (any suggestions on what to do in the city?) - it's my birthday tomorrow! We're spending the weekend doing fun things and taking some much-needed time off. 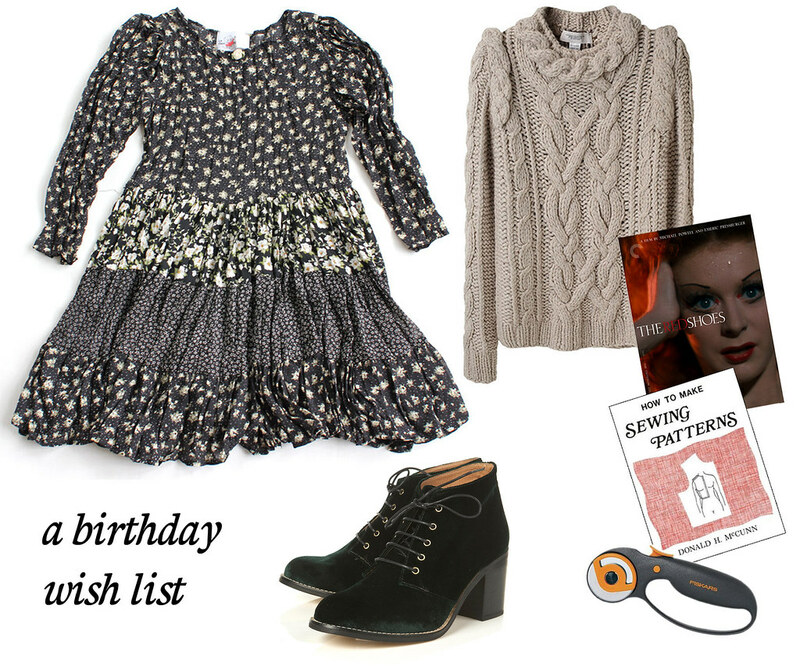 And for my birthday, here is a wish list I'm dreaming about for fall.. lace up boots in green velvet from Topshop (velvet shoes, period), a Clever Nettle vintage rayon dress (I want to wear floral mini dresses all autumn long), the loveliest - and most expensive - sweater from Pringle of Scotland (will ivory cable knit sweaters ever get old? ), classic films and some sewing supplies. I've been eyeing a rotary cutter for ages now, especially since I began making bias tape, and that drafting patterns book looks old-fashioned in the best way. I never use new patterns anyway, just old ones.. so why get a new pattern drafting book? Maybe it'll teach me how to make a ruffled collar. Alright, it's bedtime for me. Hope you have a great weekend!